As a professional avian biologist and lover of the outdoors, Sarah Sargent has devoted her life to the science and conservation of birds. The longtime President of Tamarack’s Board, she has great appreciation for the ways that Tamarack is small but mighty, helping birds and mammals with efficiency. She especially remembers one of the first bald eagles she worked with for Tamarack, Freedom’s Spirit, a large female who required three people at a time to hold her for three physical therapy sessions each week. Sarah felt she really knew this bird when the eagle was released back to the wild. Sarah is the Executive Director of the recently-founded Erie Bird Observatory, a conservation and research organization in Erie. 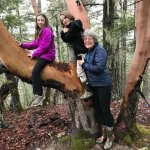 Rick Wyman brings his past careers as an elementary school teacher and as Professor of Teacher Education at California University of Pennsylvania, as well as a longtime love of nature, to his position as both Board member and educator at Tamarack. When growing up along the Massachusetts coast, his family did a lot of camping and his mother took him on many birding trips. 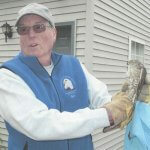 He also now volunteers with the Kiwanis Club of Edinboro and at the dog and cat rescue organization Because You Care, and he notes that “watching someone’s face light up when they see Lady our Red-Tailed Hawk or Prudence the Opossum is always a thrill.” Rick coordinates scheduling of education programs for Tamarack. 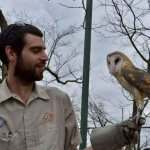 Christian Hrinda’s love for animals and desire to work with them began at Tamarack—he spent a summer as an intern and then as the summer supervisor at Tamarack and this work became “a foundation for my entire life.” Sophia, the Tamarack barred education owl, mesmerized Christian and he identifies this as the start of his love for birds. He now works as both a zookeeper at the Erie Zoo and at the Humane Society of Northwest Pennsylvania. 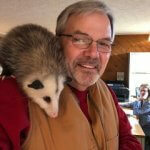 In working with Tamarack, Bob Hartman finds great rewards both in understanding changes in wildlife rehabilitation and also in helping people understand the importance of supporting wildlife and environmental protection. Awarded a permit with the Pennsylvania Game Commission to capture and transport injured wildlife for rehabilitation, Bob has served as the Wildlife Helpline coordinator for Tamarack as well as a longtime Board member. He also loves gardening and anything to do with the outdoors. A longtime bird and nature lover, Delores Tavares has been part of Presque Isle Audubon for more than 30 years and is a frequent birder both close to home and in places such as Ecuador and Panama. She notes that binoculars accompany her wherever she goes, whether to the seaside or the mountains. A retired Registered Nurse, she now also volunteers for a cancer center and hospice. Sharon Wesoky discovered her love of birds through travel to distant places as well as feeding them right in her backyard. 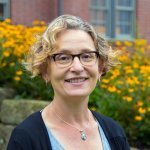 She brings her experience as a college professor to the Tamarack board in assisting in grant writing opportunities. 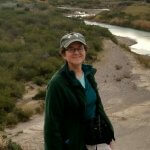 Along with birding, she enjoys photography, haiku, hiking, and trail running. Donations and memberships are the lifeblood supporting Tamarack's work of healing injured wildlife and returning them to the wild. Tamarack does not receive government funding. The injured, orphaned, and sick wildlife survive because of the generous donations of folks like you. Sharing your time and skills with the center is always welcomed. Become a member of Tamarack, sponsor a wildlife ambassador, or make a memorial contribution. It's your donations that give these animals a second chance.